Well, this rarely happens, I've managed to pick up flavors of the same name but from different companies recently. In general, I don't like to do this because it cuts into the diversity in the freezer, but I was just so enamored with the budget minded Stone Ridge Peanut Butter Cup that I couldn't help but wonder how it would stack up to the top tier Ben & Jerry's version. So, here we have Peanut Butter Cup : Peanut Butter Ice Cream with Peanut Butter Cups. Plain and simple. No fancy swirls or ribbons. Just Peanut butter ice cream and lots and lots of peanut butter cup chunks. Here's a closer look. I've just barely scraped the surface on this one and already I'm running into multiple cup chunks. How can you not get excited when you see this much peanut butter goodness just waiting for you a scoop away? So, what's the first thing you do when you crack open this pint? Oh yeah, you go right for the pb cups. The chunks are huge. I don't really see any rinky dink pieces here. Now, here comes the dilemma. The Stone Ridge bits were basically generic Reese's peanut butter cups. We've all had Reese's before, so take it down a notch, and you know what I mean. Ben & Jerry's can't go this route for a few reasons. So, Ben & Jerry's had to track down something natural and I know just how to describe it: You know how someone will try and treat you to those "fancy" peanut butter cups you find in candy shoppes and other places. It'll be a small bag, no wrappers or individual packaging. You always hope they will taste better than the last "fancy" ones you had, but they always wind up tasting the same way --- diluted, or should I call it too milky..... I've loved Reese's peanut butter cups since I was a kid. They're a little gritty, have the perfect chocolate to peanut butter ratio, and they are, I don't know, would crisp be the right word? Probably not, but it's close. The Ben & Jerry cups are like every other fancy pb cup. They are very smooth, too smooth in fact. It almost seems like they take peanut butter, mix it with milk, and then pour it in the cup. The chocolate is never the same either. Call me plain, call me simple, but it's very hard to top a Reese's. As much as I'm a big fan of all natural, this is a major sticking point for me. Maybe I should talk about the ice cream itself. Well, it tastes like peanut butter, but it's nothing to write home about. It reminds me of the homemade peanut butter ice cream I made awhile back, and while I consider my creation good for me, I can't say I was expecting a similar texture in a B&J flavor. I'm sure it has something to do with the fat content of peanut butter and how it changes the way you would typically make an ice cream, but it just wasn't working for me. Maybe if the peanut butter cups had been more salty and gritty, it would have been a nice contrast to the ice cream, but instead it's all kind of boring to me. It's always weird putting down a Ben & Jerry's flavor, it's just that I hold them to the highest of standards and expect perfection in every pint. No, it's not fair, and I know there are plenty of people who love this quality product, I just think it could be better. On Second Scoop: Just to clarify, this is a respectable, tasty ice cream, it's just not where I want to be when it comes to pb cups. I've always liked the creamy ice cream vs salty peanut butter combo, and you just don't get that here. I actually love this ice cream. It is one of my all time favorites. Reeses pb cups kind of get a waxy texture when frozen and the pb cups in B&J melt in your mouth. 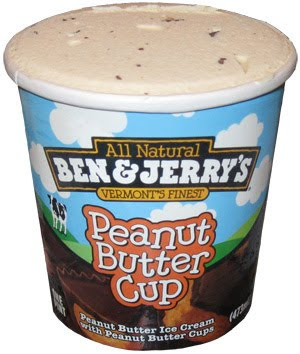 They are The best pb cups I have ever had in an ice cream. 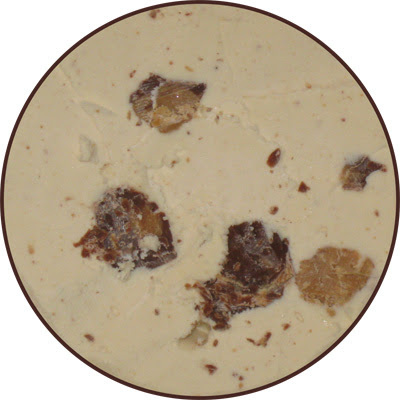 The ice cream its self is a nice creamy smooth flavor that isn't to over powering. "Ben & Jerry's never does corporate tie-ins"
Every rule has an exception... I assume it has something to do with the fact that Heath Bar Crunch is one of the very first flavors they made. I have to say I agree with you 100% if it had the salt and grit that reeses has I would luv it. I also think if it was in half chocolate and their flavor it would be better. I have no idea if the Reece's cups we get in the UK are the same recipe as in the States, but I *just* tried this flavour Ben and Jerry's and it was just like the Reece's cups! Gritty and salty, against wonderfully creamy, sweet and very slightly gritty PB ice cream. Not sure if it's a different recipe in the UK or if they've reviewed it now, but hot damn, that's a good ice cream. Might be worth another shot? @last-Anon: It's probably a safe assumption that you have different cups and now I am jealous! You may want to consider trying this flavor again. I tried for the first time last weekend... having put it off for years because it seemed too boring and simple. I was blown away. The peanut butter ice cream base was the perfect backdrop for the salty, chocolately peanut butter cups. Speaking of cups, there were easily 20-25 cups in my pint. It was pilled to the top with them. By far, the best flavor I have tried from Ben and Jerry's. Even trumps Peanut Butter World... which I never thought could happen. two people commenting that the cups are better? OK, next time I see it on sale during my lunch break, I will give it another shot.